The Bob Marshall Wilderness Complex is an administrated unit of the Flathead National Forest, the Lewis and Clark National Forest, Lolo National Forest and the Helena National Forest. The United States Congress designated the Bob Marshall Wilderness Area as part of the original Wilderness Act of 1964 and it now encompasses over 1.5 million acres. Within this complex are three wildernesses: Bob Marshall, Scapegoat, and Great Bear. Many credit early forester, Wilderness preservation pioneer, and Wilderness Society co-founder Bob Marshall with single-handedly protecting at least 5.4 million acres of wildland. The least he deserves is to have this pristine area named for him. This region, in fact, was set aside as the South Fork, Pentagon, and Sun River Primitive Areas in 1941, and designated the 'Bob' in 1964. Here is one of the most completely preserved mountain ecosystems in the world, the kind of Wilderness most people can only imagine: rugged peaks, alpine lakes, cascading waterfalls, grassy meadows embellished with shimmering streams, a towering coniferous forest, and big river valleys. The Wilderness, which includes the North and South Forks of the Sun River and the Middle and South Forks of the Flathead River, runs for 60 miles along the Continental Divide, with elevations ranging from 4,000 feet to more than 9,000 feet. 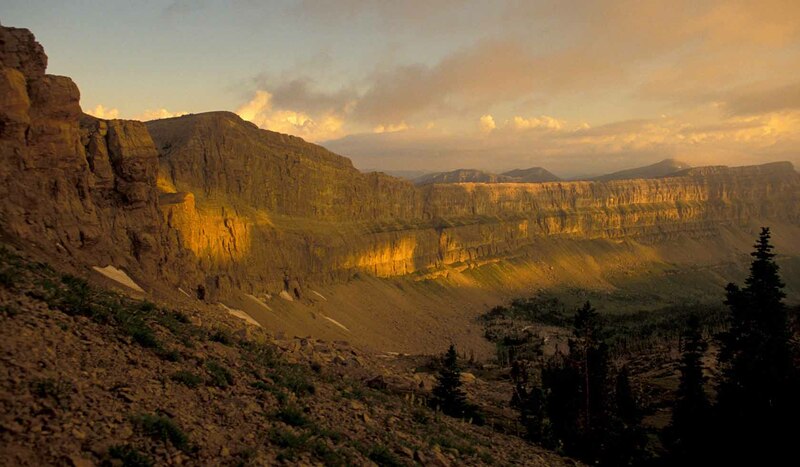 A huge escarpment called the Chinese Wall, a part of the Divide, highlights the Bob's vast beauty, with an average height of more than 1,000 feet and a length of 22 miles. The Chinese Wall extends into Scapegoat Wilderness to the south. The Bob Marshall Wilderness Complex is the last holdout habitat south of Canada for the grizzly bear and provides critical habitat to the endangered gray wolves as well. Elk, whitetail and mule deer, Canadian lynx, bobcats, bighorn sheep, mountain goats, black bears, wolverines and cougars also make their home in the Bob, along with smaller mammals such as beaver, river otters, snowshoe hares and marten. There are dozens of birds that call this area home, especially in the summer. Bald eagles, falcons, hawks, owls, grouse, and woodpeckers. In camp areas, you'll find Steller's jays, Clark's nutcrackers, camp robbers, chickadees, nuthatches and more. Summer is the major season of use in the Bob Marshall Country, with July being the peak month. From the September 15 early rifle season on, big-game hunting becomes the most popular recreational activity west of the Continental Divide. About 30 percent of the hunters go with one of the fifty-five professional outfitters who operate in the complex. Elk is by far the most popular big-game species. Rafting the wild Middle Fork of the Flathead is best from mid-July to mid-August, when good weather coincides with adequate flows. Only the skilled expert should attempt to float the Middle Fork during peak runoff in June. The wildest whitewater boils in the canyon below Spruce Park, where it drops an average of 41 feet per mile. Most of the float parties put in at Schafer, after either flying or packing in. Schafer is the only historic aircraft landing field within the compel open to the public. The Bob is classic horse country because of its vastness, relatively gently terrain, and wide mid-elevation river valleys with abundant forage for grazing. It is probably one of the few Wildernesses where horse users still outnumber hikers and backpackers. Pyramid Pass Location: Take the Cottonwood Lakes Road #477 (joins Hwy. 83 1/2 mile north of Seeley Lake). Travel east about 2 1/2 miles then turn north on the West Morrell Road #467. Continue on this forest road for another 6 miles, then turn east again on the Pyramid Pass Road (or Upper Trail Creek Road) #4381. Follow this road for 6 miles to the trailhead. Facilities: Trail provides spectacular views of Clearwater Valley and popular access to Young's Creek, Hahn Creek and the headwaters of the South Fork of the Flathead. Rated as difficult and requires hikers and packers to climb 1,640 feet within 4 miles. Use: Medium to Heavy. Mainline Forest Service trail, maintained regularly from early summer through fall. Hikers can expect to meet packstock, horses and riders. North Fork of the Blackfoot Location: The North Fork of the Blackfoot Road joins Hwy. 200 five miles east of Ovando (about 20 miles east of Clearwater Junction). To reach the North Fork trailhead, take the North Fork Blackfoot Road #4259 for about 4 miles to the intersection with the North Fork Trailhead Road #5550. The trailhead is 7 1/2 miles past this point on a good gravel road. Facilities: This is a very popular trail in the summer and receives heavy use by both hikers and packers. Provides access to the Scapegoat Wilderness, the North Fork Cabin, the Dry Fork-Flathead Divide and the Danaher River Valley in the Bob Marshall Wilderness. Rated as moderate in difficulty, the trail is usually well maintained by Forest Service crews and outfitters. The trailhead area has toilets and a stock unloading ramp. Use: Medium to Heavy. Hikers can expect to meet packstock, horses and riders. Location: The Monture Creek Road #89 joins Hwy. 200 about 15 miles from Clearwater Junction at the Ovando turnoff. Take the Monture Creek Road about 8 miles to the trailhead. Facilities: Campground near the trailhead maintained by Forest Service. Also, there is a Forest Service Guard Station nearby. 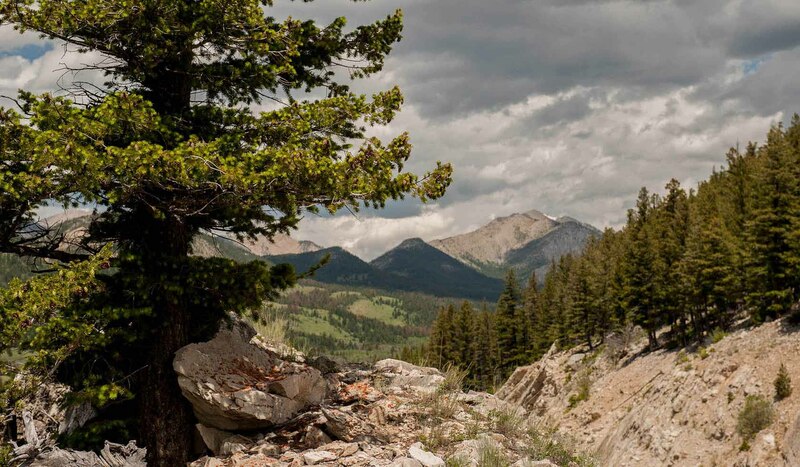 Trail goes through roadless areas for about 10 miles to Hahn Creek Pass, which provides access to the Bob Marshall Wilderness, South Fork of the Flathead River and the Hole-in-the-Wall cave. Rated as moderate to difficult. Use: Medium to Heavy. Hikers can expect to meet packstock, horses and riders. Smith Creek Pass (Falls Creek Road) Location: Smith Creek Pass is accessed via the Falls Creek Road #901 which joins Hwy. 83 across from the Condon Work Center in the Swan Valley (about 26 miles north of Seeley Lake.) Take the Falls Creek Road about 4 miles and turn southeast on Smith Creek Road #9762 for about a mile to the trailhead. Facilities: Parking area is limited. Trail is rated moderate to difficult on the west side of the Swan Range (going up over the pass), but is rough and rugged on the east side going down into the Little Salmon Creek area of the Bob Marshall. Use: Light use early summer to Moderate use by fall. Location: Accessed via the Van Lake Road about 12 miles north of the Condon Post Office on Hwy. 83. Follow signs about 4 miles to the trailhead. Facilities: Trail is steep (up and over the Swan Range) and provides access to the Little Salmon Creek Trail. Lion Creek Trail rated as more difficult. Use: Moderate to Heavy, especially in the fall. Hikers can expect to meet packstock, horses and riders. Main route for local permitted outfitter. Bob Marshall Wilderness entrance points from Montana's East side include Choteau, Benchmark/Augusta area, Gibson Reservoir/Dam, and the Birch Creek area. Trailhead/Access Point directions and maps document provided by the Lewis & Clark National Forest. More information on the Bob Marshall is available from all four national forests. Information on the Scapegoat Wilderness can be obtained from the Lincoln Ranger District and Seeley Lake Ranger District. Information on the Great Bear Wilderness is available from the Flathead National Forest. The Bob Marshall Wilderness Complex is accessible from numerous surrounding communities. From the west side it can be reached from Seeley Lake, Swan Lake, Hungry Horse, Kalispell, Ovando and Lincoln, Montana. From the east side it is reached from Choteau, Augusta, Dupuyer, Bynum and Browning.